I am extremely excited! 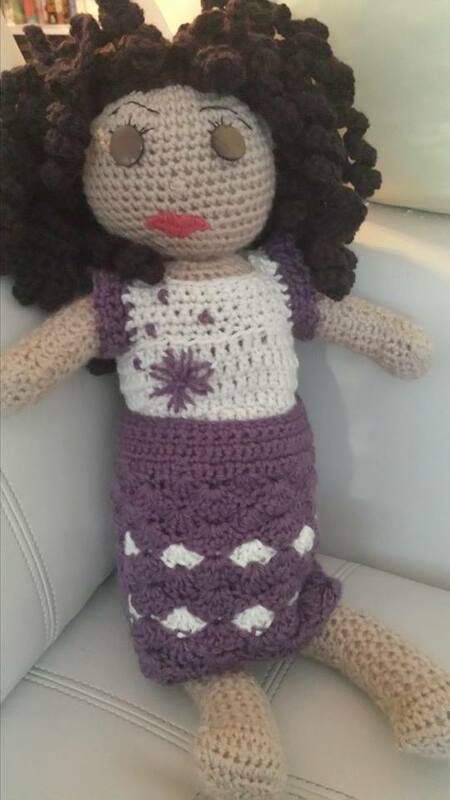 My sister-in-law and one of my best friends just finished making her very own doll using the techniques in my almost finished book. I gave her a rough copy of the book to try out so she could give me feedback. She is my target audience, namely someone who crochets but is intimidated about creating something off top of their head. My book is more of a tutorial than a pattern book. I wanted to pick her brain about whether said tutorial made any sense and how I could make the book better. I can’t describe how elated I felt to see her post on Facebook showing off her finished doll! She has been there right along with me as I’ve been improving my skills on my dolls. She would often make comments about how she wished she could do it herself. I would explain the process to her but she would always say she wasn’t creative like me. She would argue she couldn’t just pick up a hook and make one without a pattern. I always shot back that she was creative and she already crocheted and knitted (which I can’t do so kudos to her) so she was already creative. I would start prattling on about how I created them and about how It was a process I followed and not necessarily a pattern and blah blah blah. That’s when her eyes would glaze over. I suspect she just wanted me to make them for her (giggle). The idea for the book was actually born and inspired by her because I absolutely knew she could just pick up a hook and make a doll (or whatever else she wanted). My friend and I are both avid readers so instead of prattling on to her about how I make my dolls, I decided to put it down on paper and surprise, surprise, she discovered she is creative! It didn’t work when I was throwing words at her but I’m so happy it worked in book form. I am so proud of her (and grateful she was willing to spend time on this whole project) and I love her doll! It was definitely helpful to see it in writing and have the pattern…hoping to get the little sister started soon! I like this doll a lot! Cute!